As some of you know, I recently had surgery to remove my gallbladder. This was to address a medical condition called cholecystitis - essentially, I had stones in my gallbladder which occasionally caused blockages. It was a pretty frustrating experience leading up to this point. I had started having symptoms for this condition a couple years ago. In fact, I went through a similar enough set of symptoms nearly ten years(!) ago (although it is a little unclear whether it was the same cause or not). Typically, I would start feeling pretty intense stomach pain late at night usually a few hours after a fairly big meal. Often times, I would be woken up by the pain starting around two or three in the morning, and the pain would last for a few hours before eventually subsiding. It wasn't every time I had a biggish dinner that caused symptoms -- in fact I went months at a time where I didn't suffer any symptoms despite not really changing my eating habits. At the beginning of December 2014, I had a particularly bad attack. The attack began just like other ones; around two in the morning, I woke up with some pretty serious stomach pain. This time though, the pain didn't go away. By 9AM, I let work know I was going to be out sick for at least a few hours. By lunch time, I was freaking out because the pain had never lasted that long before. I called my GP and got a quick appointment. He ended up sending me to emergency to have it checked out, suspecting that I had gallstones. I ended up at the Hermitage medical clinic around four of five o'clock, still in significant pain. They did some tests, and I spent a fair amount of time sitting around waiting, but eventually a doctor saw me and told me that I had an elevated white blood cell count and temperature. They wanted to admit me overnight and do some tests the next morning to check for early onset appendicitis - which was a bit of a baffling thing to hear given what I had said about past symptoms. But I was happy to stick around and have them figure out what was wrong with me if they could. So I stayed overnight and got an ultrasound scan in the morning. It was then that I found out for sure that I did have gallstones. Finally, a cause for my symptoms! They made me hang around at the hospital for the rest of the day and overnight again, I think mostly to monitor that my symptoms had settled down properly. In the morning, the doctor stopped by and talked me through the procedure that I would need to get: a laparoscopic cholecystectomy. Essentially, removing the gallbladder using keyhole surgery. But they couldn't perform it right away - they needed me to wait six weeks to let it get less inflamed. So I was sent home with instructions to stay on a low fat diet for the intervening period. The surgery date was on Wednesday the 21st of January. Diane and I showed up at the hospital just before 8AM and got me checked in. There's a barrage of forms and questions you need to go through, with many of the questions asked several times (just in case you remember a crown you've got or an allergy you were forgetting). Pretty soon I was all set and was brought to the operating room. The operating room had a staging area outside it. Both the door to the staging area and the room itself had big metal doors that slid open at the touch of buttons labeled "patient" and "staff". While in the staging area, they sat me down and got me to sign the consent form as well as outfit me with an IV in my hand. I was a little nervous at this stage (hey who wouldn't be? ), but there wasn't much else to do except go through with it. Once the last preparation steps were done, they hit the patient door button and led me through to the operating table. The anaesthesiologist stepped up and set up my anaesthetic, and soon I had passed out. When I came to, I was pretty groggy and don't really remember much except being tired. I don't really remember if someone woke me up or if I just came to on my own, but soon enough I could hear the nurse outside giving Diane a call to let her know that I was back awake. I don't know how long I would've been in surgery for, but they began something like 9:30 in the morning and I woke up after 1:00. Once fully awake, the hospital staff set about prepping to discharge me. They gave me a little bit of toast and coffee which was pretty nice since I had fasted since dinner the previous night. In not too much time I was painfully getting dressed and Diane was driving me home! On to the healing. The first couple days were pretty painful. There are four holes in my abs: three in a row just under my ribs and one right on my belly button. It's a little surprising how often you want to use your ab muscles to sit up. Okay, maybe not that surprising, but you sure notice how often you want to use them when they hurt so much! Each day has gotten remarkably better though and I'm starting to feel well enough that I might take on a walk outside tomorrow or the next day. Diane has been taking really good care of me. I'm pretty glad she was able to return back to Dublin for a few weeks before she returns back to Canada (It's a long story, but her mom's knee surgery is now scheduled for the end of January). I think the first couple post-surgery days would've been awfully tough without her here, and she's been pretty patient with me making sure I have everything I need. I have one more week off work. Given my healing progress so far, I imagine that'll be enough to get me back on my feet and back to work. In the meantime, I've already put quite a few hours into playing the latest Dragon Age game and will probably keep that going this week! It's that time of year again - time for my once-a-year blog post about what happened to us in the past year. 2014 went by in a hurry. It's a little hard to believe it's already 2015! Anyway, let's get to what happened. Diane and I were in Canada from the start of January. As I mentioned in last year's review, this was the first time we were home for Christmas since we moved to Ireland. Once the Christmas break was over, we went on a pretty busy couple of weeks of visiting friends before I had to fly back in mid January to return to work. Diane stayed in Edmonton for another month to continue to help her mom recover from her knee surgery. The big event in February was the winter olympics in Sochi. We didn't go... but the winter olympics are always exciting as a Canadian - particularly for the men's and women's hockey tournaments. The hockey was excellent this year, with both the men and women taking home gold again. The women's gold medal game against the United States was a pretty memorable one. The men dominated the tournament with defensive play, and won without too much trouble (other than some scary moments when they ran into a brick wall of a Latvian goalie). Anyway, for the gold medal game against Sweden, a group of us Canadians ended up at the Woolshed to watch the game. The venue was a madhouse of mostly Canadian expats (but some Swedish ones too), and it was a good atmosphere to watch that game. In March, our company put on its annual staff poker tournament. This time around I ran really well and ended up almost final tabling the tournament, busting in 10th place. My prize was a giftcard to Opium restaurant - which we would use later in the year. Later in the month, our hockey team was preparing for a tournament in France, so we got the chance to have a training session at the Odyssey arena in belfast. After the training session we hung around in Belfast to see the Belfast Giants play in the same arena we practiced in earlier. Finally, at the end of March, I attended a citizenship ceremony to become an Irish citizen! It's a little hard to believe that we've been in Ireland long enough already that this was possible. 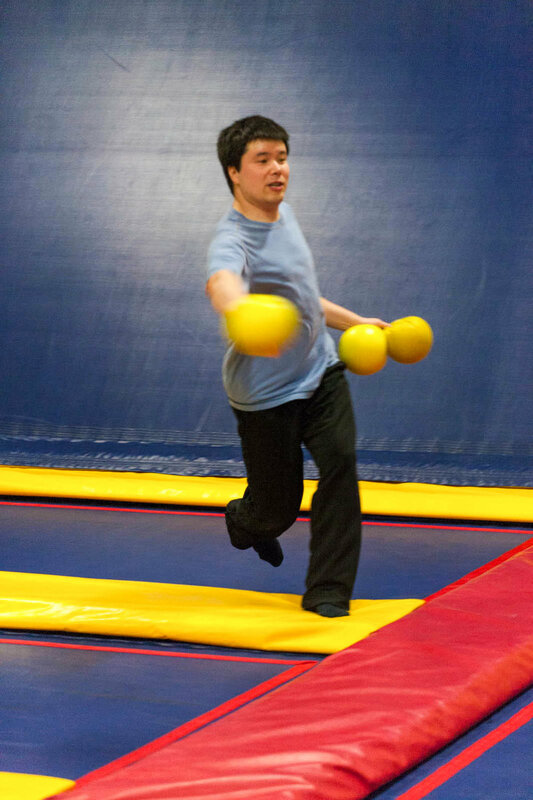 Our office social committee took us to Jumpzone - which is a trampoline park where you can jump around a bunch and even play dodgeball on trampolines! It was a pretty fun day, but I was pretty sore for a few days afterwards! Our hockey team also made another trip up to Belfast to train some more before France as well. On the second weekend of May, our hockey team made our trip down to France for a fun tournament. It was held in Strasbourg, which is lovely in May. Our team is a pretty recreational team, so we weren't really expecting to be very competitive. Still, we managed to eke out three wins out of eight games, which was a pretty amazing result for us. After returning to Dublin from that trip, we then moved apartments again. Our Dundrum apartment we were living in before was alright, but we decided we liked another apartment better and jumped at the chance to get into one of these units. The move went relatively smoothly, although it isn't really ever very fun to do. We returned to Sabor Brazil for another fancy dinner as kind of an anniversary dinner (it was a little late for our anniversary). It was a pretty lovely meal. The following night, we used another voucher for a cooking class on sauces and salsas. That was a pretty fun session actually - there was some hands on preparation, and plenty of samples from the demonstrations as well. The company threw a summer party which was a pretty fun day. Mostly a day to enjoy some food and drink. The weather held alright although there was a little rain that ended up chasing us inside. In August, our good friend Max had his stag weekend. Nick planned a really fun weekend away in Carlingford. There was bubble soccer which was pretty crazy. There was also an outing for some outdoor laser tag, which was pretty awesome actually. It was basically playing paintball but with laser guns. I actually much preferred this to paintball. It eliminated the pain and messiness part of paintball from the equation while retaining the strategy and outdoor theatre of paintball. In between the physical activity events, we had a fun night out in Carlingford as well. Also in August, Diane's brother Eric and his wife Deanna visited us as part of their trip to Europe. The weather held out pretty well for their trip which included a lovely day out at Howth as well as some nice dinners. September was a crazy busy month for us. Our good friends Max and Lisa had their wedding at Dunboyne castle. Diane and I stayed out in Dunboyne overnight and attended both the wedding/reception the first night and the afterparty the second night. It was a very fun weekend, and a lovely wedding. Then, we traveled back home for another friend's wedding, this time Jeff and Kareena. September is a very nice time to be back in Edmonton (much nicer weather-wise than December!). Jeff and Kareena's wedding was a very nice day. The weather was gorgeous (it was HOT out! ), and the ceremony and reception were both lovely. The rest of my short trip was a whirlwind of jumping from social engagement to the next. One of my favourite bands happened to be playing Edmonton while we were there, and our visit coincided with our friend Rick's successful PhD thesis defence. So in CS tradition he had his department wide free beer, which was cool to be in town for. There was also department games party at Rob Holte's house, which was another really fun evening. It had been several years since the last time I was at a CS games party. As with other trips home, Diane stuck around a little longer than I did into October to hang out with her family. Diane was still in Canada for thanksgiving, but my friend Josh held a thanksgiving dinner at his house which was pretty great. He and his wife Kim put on a pretty fantastic dinner party, which I've been lucky to experience a couple times. Our team at work also had a night out for dinner which was a good time. We went to Yamamori, which is a great place in Dublin to get sushi. Early in November, there was a friend in town so we got out for a steak night at FXBs. Diane and I also had tickets to see Lindsey Stirling that night as well, so we had our lovely dinner and then ran off to see a pretty fantastic show. For those who don't know, Lindsey is a YouTube star known for her dubstep inspired violin. Diane and I managed to score seats on the balcony which was an excellent spot to see the show. Diane planned on returning to Canada to help with her mom's second knee surgery in as many years. So to spend a little time together before she left, we drove up to Westport and spent a weekend up there staying in a couple of nice getaway type hotels and just relaxing with some nice food. Near the end of the month, Diane got her citizenship ceremony. It was down in Cork, which gave us an excuse to head down a day before and spend an evening there. It was a nice time, and it was good to get her ceremony out of the way before she went back to Canada again. Soon after Diane left for Canada, I had an incident where my stomach flared up again. Over the last couple of years I've had trouble with what appeared to be random stomach pains. In most incidents it would happen late at night and would typically last for a couple hours before dissipating. This time, the pain started at 2am and lasted all morning and into the afternoon. I ended up in the hospital that afternoon and they admitted me for a couple days to monitor me and do some scans. They found out that I had gallstones, and because of my symptoms they recommended that I have surgery to remove my gallbladder. I'm a little nervous about the surgery, but I'm actually awfully happy to have an answer to the stomach pains I've been experiencing. Hopefully everything goes well when the surgery happens in January. The weekend after being discharged from the hospital, the company held the annual Christmas party. It was a pretty nice setup at the DoubleTree hotel in Dublin. There was a nice dinner and plenty of drink to have. I took it pretty easy though, since I was on antibiotics and under instruction to maintain a low-fat diet. The holiday period has been pretty quiet for me. Max and Lisa held a dinner party and kindly made extra effort to give me a menu suitable for my dietary restrictions. Josh and Kim played host to me on Christmas day, and put on a nice menu as well that suited my diet. Next year already has some exciting stuff setup. My surgery is scheduled for late in January, which hopefully goes well. In March, one of my favourite bands - Kamelot, is coming to Dublin. And in May, we're going to the Hockey World Championships in Prague, followed fairly quickly by another trip to Strasbourg with the hockey team. And I'd like to fit a skiing holiday somewhere in there as well! I hope everyone had a good 2014 and that 2015 is even better. Time sure flies when you’re busy and having fun! For the first time since moving to Ireland, Diane and I went home to Canada for Christmas. So by the time I got back, it was already partway through January. This caused this post to be delayed quite a bit, since I had all the catching up to do when I got back. But! Even though this blog only manages a blog post a year, I still like doing my year in review! So it might be February already, but hey ... it's never too late right? After returning to Dublin, Diane headed back to Canada for an extended visit leaving me to my own device for the better part of two months. I made sure that I kept relatively busy though. Our hockey team had a final hurrah at a little tournament held in Kilkenny. Amazingly, six different teams showed up for the tournament. Our team being pretty newbie-heavy didn't do very well, but did win one game at least! In early February, our department had our delayed Christmas party (yeah, so what if it was more than a month late?). Part of the reason was the company had already thrown a relaunch party so throwing another open-bar shindig for the whole company was deemed slightly excessive. So instead, each department got a budget to have their own small party. For this occasion, the IT department went to a venue in town, and we had a nice dinner and drinks. The company also threw a freeroll poker tournament in February with a bunch of cool prizes. Unfortunately, I didn’t walk away with the 3D home entertainment system. Oh well, maybe in 2014. Finally, my friend Kepi from Canada flew over to Europe to join me and a colleague from work to go skiing at Cervinia in Italy. A week long of skiing with pretty darn good weather, snow conditions, and delicious Italian food was definitely a good time! Cervinia physically borders Switzerland and is on the opposite side of Zermatt, which is a famous ski resort known for the Matterhorn mountain. We had a comfy stay near the ski lifts in a hotel that served us delicious (plentiful) dinners every night. Diane returned to Dublin briefly before the two of us headed over to London to visit our friends there and see Louis CK perform. You can watch a recording of a (different) performance of that show by grabbing a copy of "Oh My God" - you can get it direct from his website. The big event in April was my decision to finally do something I'd talked about doing for years: go get my vision corrected with laser eye surgery. The experience itself was pretty trippy, and both easier and harder than I thought it would be. I'm happy to say that the surgery went very well, and a few months after surgery my vision was better than 20/20 (I haven't had it measured since). The surgery has improved my life - certainly making playing hockey or swimming much better experiences. I kind of wish I had managed to get around to it before the Bahamas trip! We had been trying to get my sister over to visit us in Dublin for awhile, and we were finally able to make the schedule work out. Her plan was to return to school in the fall, so the spring was a good time of year to steal her over for a couple weeks. While she was here, we managed a fair amount of touristy things including a trip down to the Ring of Kerry. For the second time, Diane and I got really lucky with the weather and managed to see the Skelligs with incredibly nice sunny weather. We took my sister to a couple of our favourite restaurants from the last time we were down that way, and otherwise just enjoyed a rare chance to hang out. It was a busy June. Our apartment we had lived in for nearly our whole time here was going to be sold so we needed to find a new apartment. We got a fairly lengthy notice period, and managed to find a suitable place to move into for early June. We hired some movers to help move our accumulated stuff the hop skip and a jump to our new place which went pleasantly smoothly. Later on in the month, one of Diane's choir friends invited us to see her lock house. These old houses line the canals in Ireland, and would be where the guy lived who was able to operate the part of the canal that could raise or lower the water for the boats that went up and down the canal. These days, boats that use the canals have their own key to operate the lock so it isn't required to have anyone live there anymore. So these old houses are either falling into disrepair or used as the equivalent of summer lake homes in Alberta. So Diane's friend kindly hosted us there after a little bit of hiking around the area and a quick stop to pick up some delicious steaks at a small-town butcher shop. It was a lovely sunny day for a hike and then a fire-grilled steak dinner in rural Ireland! The company social committee planned a fun event in the late part of the month. We went up to Phoenix park for an afternoon of driving Segways. I'd only been on one briefly at the University, and this was a much longer session which involved a nerf gun and water fun fight, and learning to play segway polo. Although Diane and I celebrated our 5th anniversary in June, we didn't get to our own celebration for it until early July - we booked a dinner at Sabor Brazil. This is Dublin's top ranked restaurant on tripadvisor, and we managed to score two-for-one groupon-style vouchers for dinner there. It was a memorable dinner, and we enjoyed it immensely. Later on in July, the company held a family summer party. The party was largely indistinguishable from previous summer parties the old company threw except that the venue wasn't quite as ritzy. But otherwise, there was plenty of outside ridiculous activities to participate in including an archery range, segway course, bouncy castles, and human foosball. Plus of course the BBQ lunch and open bar that stayed open until late into the night. The summer continued to bestow wonderful weather on us and this was one of several absolutely gorgeous weather days of the summer. In August, Full Tilt sponsored the UKIPT stop in Galway. The company spent a lot of money building a "poker village" that had a fantastic players lounge. So a couple of my colleagues and I went down to Galway for a fun weekend of playing a bit of poker and enjoying Galway. We discovered a fantastic little restaurant called Rouge which had an incredibly good menu for astonishingly cheap. Definitely on the list to return to! The big event of September was the wedding of my good friend and colleague. He had a destination wedding on the island of Vis in Croatia. It was quite a trek to get there: a flight from Dublin to Birmingham, an overnight stay at the airport hotel, an early morning flight to Split, and then a ferry to Vis. But it was a pretty magical weekend -- the weather was fantastic, and the happy couple had a full weekend of events for us. The wedding ceremony itself involved hopping in a speedboat to take us to the neighbouring tiny island. After the ceremony, we enjoyed a lovely sunset while sipping on a glass or two (or more) of champagne before returning to Vis for the reception. The reception was held in an open-air restaurant that served up an incredible many-course menu. The restaurant had a magical atmosphere: almost more of a garden than a restaurant. Tables nestled on patios linked together with steps, lots of greenery, and a lit fountain all added to the ambience. The next day, we hopped aboard a boat that the couple had hired for the day and got a tour partway around the island. The boat operators sang for us, served us food, and gave us opportunities to hop into the Croatian ocean for some swimming! Diane and I were sad we hadn't booked a couple extra days off to enjoy more of the island. I guess we'll just have to go back! After returning from the wedding, and all through October, work ramped up to crazy busy. It really didn’t leave much time for much else other than work and trying to relax from work in the evenings and weekends. So we didn’t get up to much, although there was a company social outing to do some ice skating at one of the holiday rinks that open up around Christmas time which was fun. Just at the tail end of the busy work push was UKIPT Isle of Man. This was a special poker tournament because staff was allowed to play the main event, which was kind of nice. After Full Tilt was purchased, we weren’t able to play in the UKIPTs anymore. But an exception was made for the event on the Isle of Man. So we had a small office satellite to the main event and I was fortunate to win it. My prize was not just the main event fee (£1100), but also hotel and flights, so that was pretty nice. I didn’t do well at the poker all weekend, but the trip was still pretty cool. I got to meet a fair number of the Pokerstars staff and met some poker players who were cool to hang out with and chat with. So it was a pretty fun trip overall. It was a pretty busy December for me. Diane returned to Canada to help out with her mom’s knee replacement surgery that happened at the beginning of the month. While she headed off to that, work was busy as we tried to get some aggressive projects done before the Christmas break happened. In the middle of that, a couple colleagues and I went off to Latvia for a fun lads weekend away to watch some KHL hockey games, and enjoy some Latvian food and beer. We actually did a trip like this a couple years ago, and this was also quite a blast. The company also threw a Christmas party which was pretty fun. It was held at the O2 VIP lounge, which was almost too small for the large number of employees that now work for Full Tilt and Pokerstars in Dublin. There was a live band, a magician, and as much as you liked to drink, which made for a fun evening. Finally, I joined Diane in Canada for a few weeks over Christmas and New Years. This was the first Christmas we’d been back since we moved to Ireland, and man was it COLD! Yeesh, Edmonton sure wasn’t making a case for us returning in a future winter. But anyway, it was good to see friends and family for a good long visit. I did manage to see quite a few people, but not everyone. So I apologize if I missed you on this trip - I'll try and catch you on the next one! 2013 was a pretty fun year overall. We had quite a few fun trips, including more sun holiday trips than I've done in a year (Bahamas and Croatia). Let's hope 2014 is fun too! Wow, 2012 is coming to an end and I'm a little surprised. It was an eventful year for us - one which had us wondering a bit about what was around the corner, but still a reasonably enjoyable one all in all. Since we once again failed to post very much (okay, at all) this year this will once again be a fairly long post catching you up on what happened this year for us. Overhanging most of 2012 was the uncertainty around work. My employer was running out of money quickly since it had no income from about late June 2011. It made it difficult to make any really long term plans as we had no idea if we would continue to stay in Ireland or if the company would somehow find its way out of the hole it had dug. In January, Diane returned to Canada for 6 weeks to help out her mother after she had knee surgery. 6 weeks is a long time to fill on your own … but I managed to fill in some of the time with a few trips. The first of these was yet another trip up to Belfast to take in an (ice) hockey game. A few colleagues and I took the train up and then had a nice dinner after the game before hopping on an after-midnight bus back to Dubiln. A week later, pretty close to the same set of colleagues went on a lads weekend away to Riga, Latvia. The main purpose of the trip was to catch a KHL hockey match between Dinamo Riga and CSKA Moscow. One of the guys going on the trip is of Latvian descent and knew the language and the city pretty well. So for the rest of the weekend he showed us around. It made for a nice relaxing weekend away. Things didn't slow down for exciting things for me at all in February. A group of four guys from work went on a week-long ski trip to a resort called Madonna di Campiglio in Italy. The same guy who showed us around Riga goes to this resort nearly every year and was happy to bring us to his 'home resort'. The weather was excellent, the food was fantastic, and the skiing was gorgeous. A couple weeks later, it was time for UKIPT Galway. Our group of friends has done really well at this series of poker tournaments over the last couple years, and this particular event would be a fantastic one for our group. Not only would a couple of guys go deep in the main event including Nick who made his third UKIPT final table, but three of us including me would go deep in the €300 side event, which I eventually came 2nd in for a €11,800 score. To top it all off, Max won the high roller event. Our group took in over €50,000 in winnings that weekend! Diane found a groupon-style deal for flying lessons awhile back, and on March 18, we finally got out to use them. One at a time, an instructor took us up in a Cessna plane and we were even given control of the plane in the air for a little while. It was a pretty fun experience that we're both glad we got a chance to try. The other big event in March was the discovery of ice hockey in Dublin! A small ice rink had opened in Castleknock in Dublin, and a surprising number of people were attending weekly hockey training sessions. So a few of us went up to try it out. Despite the small ice surface, the guys training were willing for us to join them and so a few of started going every week. Eventually, Mike and I bought all the gear so we could play without fear of our shins getting hit by a puck. My folks made their third appearance in Dublin in between a trip to Europe to see the family that lives in Austria. During their visit, we made a weekend trip to the fantastic Ring of Kerry. We basically repeated the trip that Diane and I did on our own back in 2010 - with a couple of small differences. One of this was a stop at the Gap of Dunloe - a picturesque area to do a little walking. We capped off their visit with a trip to the Merry Ploughboy - a traditional Irish music pub which does a touristy show and dinner. It was a pretty nice little evening. Later that month, Diane and I went to Paris. Our main purpose of going to Paris was to see a trio of bands (Epica, Stream of Passion, and Xandria) perform there, which seems like a pretty good excuse to finally make it to Paris (Diane had been previously but this was my first trip). We arrived late on Friday night, and spent Saturday walking around in a drizzly day. We met up for dinner that night with the same friend of Diane's who hosted us in Lausanne, Switzerland. On Sunday we joined the queue for the Lourve and spent a good portion of the day wandering around there. I think my favourite part of the Lourve was the architecture of the building. It really is a pretty stunning place. The show on Sunday evening was fantastic -- the venue was pretty big and well laid out, and the sound quality was excellent. As spring moved on into summer, we found ourselves not nearly as busy with trips as the prior months. Part of the reason for this was it was getting pretty obvious that the work situation was going to be sorted out one way or the other sooner rather than later. Up to this point we had constantly been promised that news on a deal to restore the site to operation would be coming soon. It often felt as close as a week or two away or at the very least not more than a month away. The mood and moral in the office was starting to get pretty bad as people seemed to be leaving for more stable employment almost every day or two. Diane's sister was due to get married at the beginning of August. So Diane went back to Canada to help setup the wedding a few weeks before-hand. I joined up with them in Vancouver at the beginning of August to take part in the festivities. A few very warm days in Vancouver were quite enjoyable. The wedding itself was lovely, and the reception was quite nice -- including some bonus fireworks at the end courtesy of the Vancouver Celebration of Lights which they hold every summer. After a few days in Vancouver, I flew back to Edmonton to spend some time with friends and family. Diane joined me a few days later after doing a quick road trip down to Seattle and then back up to Edmonton. It was good to see everyone that we did get a chance to see. Apologies to anyone we missed -- we'll get you next time! A couple days after landing back in Dublin, the hockey team we'd been training with made a trip up to Belfast to play a late night hockey game against one of the rec teams up there. So despite being a little jet lagged, I drove up with a Mike and Andrej to go play. We lost by a few goals, but it was a fun contest… one where I scored a flukey goal off a defender. The relaunch effort at work was very much in full swing by now. The pile of work looked insurmountable, and there just weren't enough resources to devote to all the things that needed doing. Our work days got longer and there wasn't too much time to devote to much else. Despite that, we did get out to a couple of fun things. The company threw a "Fresh Start Party", at which the staff were treated to a night out with an open bar and got a chance to mingle with other staff. Gus Hansen, a professional poker player and the first of our signed pros, made an appearance and we spent a fair amount of time chatting with him. Diane and I also got out to see Dara O'Briain's "Craic Dealer". Dara is an Irish standup comedian who we've been trying to see for ages. I finally just decided to buy tickets as soon as they came out which was about 8 months prior to the show. So finally we got a chance to go see him and it was an excellent show. There's a DVD out if you're interested - he's very funny. The relaunch of November 6th was looming at work, which made October a very work-heavy month. We did make it out for one quick weekend trip to London to see some friends there. While both sets of our friends had been there for more than a year we hadn't had a chance to get over there to see either of them … and one set was about to have a baby and would be moving away from London after the baby was ready to travel. So time was starting to get short to see them while they were still close! So a quick visit was in order which made for a nice weekend away. Amazingly, despite the amount of work that needed doing, we managed to somehow get the site back up and running with very few problems. The relaunch day went way better than anyone really had any expectation of. Players flooded in and sat down to play on the site after more than a year of no action happening. It was an incredible day. A couple weeks later, the company threw a relaunch party. They booked out a night club, had plentiful food and drinks, and a good time was had by all. Also in November, the Celtic Clovers (which our hockey team was called) made two trips up to Belfast to play games. One game against the Foxes, and another against the Prowlers. We lost both games by wide margins, but once again I managed to score a goal in one of the games. There's even a picture that Diane took for proof! Finally, one of the groupon style coupons we got was for a significant discount at a fancy restaurant called L'Ecrivain. So Diane and I went out on a Tuesday night for a very enjoyable tasting menu. This meal capped off several excellent dining experiences we had over the last few months - including a tasting menu at Bang Restaurant and a couple of nights at the Dublin cookery school popup restaurant night. It was a very good year for trying some tasty meals. This month, we went on another KHL hockey game trip, this time to Bratislava. Andrej is from Bratislava, and he proved an able guide around the town. He was also key in acquiring the tickets as there was a complicated auction process involved in getting them. It was quite a nice weekend where we enjoyed the local Christmas markets, had some good food and beer (Staropramen Black is very tasty), and walked around to see a few sights. Just before Christmas, the Clovers made one last trip to play a quick hockey game against the Kilkenny Storm. This was quite a bit closer to Dublin as we didn't need to go all the way up to Belfast. The Kilkenny team only had about 8 people there to play for them, but they were a very strong side and we ended up losing by a significant margin. Still, it was an enjoyable game! It's been an exciting year. Lots of trips and stories and pictures. I'm quite happy with how the work situation has resolved itself so far, and that means we might stick around Dublin for awhile yet to see how it continues to go. Early next year, we have a trip to the Bahamas to look forward to … and I'm sure there'll be a lot more to see and do as the year goes on. I hope everyone had a good 2012, and here's to a better 2013! As usual, I'll leave you with a selection of some of my favourite photos from the past year.